Colonial Williamsburg, Virginia – Return to the days of Colonial America in this living-history town that offers wonderful tours, reenactments, tastes, smells, and sights of “colonial villagers at work.” Perfect for American history buffs and for kids and adults of all ages. Should your children get their fill of the 1770s, you can also head to one of the nearby amusement parks. Destin, Florida – Want to avoid south Florida’s South Beach prices? Head north to check out Destin, located in the Florida panhandle. 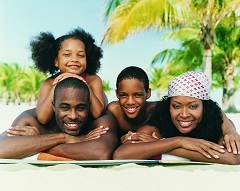 Enjoy beautiful beaches and attractions for the whole family without worrying about your bank account. Grand Canyon, Arizona – Seeing this magnificent natural wonder is an experience that every family will enjoy and long remember. Be sure to make hotel reservations in advance, since rooms can fill up quickly during peak season. Gulf Shores, Alabama – The beaches are beautiful and you can sunbathe to your heart’s content. However, you can also visit the zoo, ride through the sky on a zipline course or go deep sea fishing. Portland, Oregon – A gem of a port city that should not be overlooked as a summer destination when visiting the Pacific Northwest. You’ll find a number of family-friendly attractions including some of the finest natural beauty in the U.S.
St. Augustine, Florida – This northeastern coastal Florida city makes for a swimmingly delightful vacation: fascinating historical landmarks, eye-catching architecture, delightful ambiance and the ocean all in one location. Visit a Spanish fortress built in the 1600s, delight in the oldest wooden school house in the U.S., stroll along the promenades or relax at the beach. Sedona, Arizona – Children love the exciting Pink Jeep Tours and natural water slides in enchanting Sedona, one of Arizona’s many wonderlands. Be sure to visit the Hopi Reservation to view the ancient “stacked” pueblo homes. Washington, D.C. – Living in our cherished and architecturally beautiful nation’s capital can be pricey, but visiting doesn’t have to be. Take advantage of the numerous free museums and monuments, the excellent public transportation and the less expensive accommodations outside of the city where you could stay. Yellowstone National Park – Watch your family gaze in awe at the famed mountains, lakes, geysers, hot springs and wildlife, in this park that spreads into Wyoming, Idaho and Montana. To tighten the purse strings, skip the hotel reservations and stay in one of the Yellowstone campgrounds. Yosemite National Park, California – If your family loves hiking and the outdoors but hasn’t yet been to Yosemite, this just might be your year. If you don’t feel like camping in the park after your day of adventure, you can still save money by taking the free bus service that runs to and from Yosemite to nearby locales.